Founder of A. Ghani Qarooni & Associates, he established his Firm in 1965 as one of the first legal firms in the Kingdom of Bahrain. Since then, he has been providing professional services in numerous fields of law. In 1977 the Kingdom witnessed distinguished developments in the banking and financial sector and consequently the variety of our clients which was when he associated with Messrs ILIFFE & EDWARDS of 5 John Street, London, UK where a law firm was established under the name Qarooni & ILIFFE & EDWARDS to provide expert legal services to international banks, companies and offshore banking units. The association was sustained until 1983. Thereafter, Mr. Qarooni associated with Messrs CAMERON MARKBY of Moor House, London, UK, and a new Firm was established under the name of Law Office of A. G. Qarooni and Associates achieving another milestone. That union widened the scope of his work and eventually increased the legal services provided to local clients and offshore based companies & banks. 1988 is labeled to be a landmark in his legal journey as Mr. Qarooni decided to become independent which was when his Firm gained its current named A.Ghani Qarooni & Associates. He is a certified Arbitrator with an extended experience in dealing with commercial lawsuits and disputes. He is also an admitted Bahraini Bar, a founder member of the Bahraini Bar Society, a member of the Arab Lawyers Union as well as the GCC Commercial Arbitration Centre. Member of the Chartered Institution of Arbitrators as well as the Bahraini Bar Society where he served as a Board Member for two terms. He joined A.Ghani Qarooni & Associates in the year 1993 at age 21 while he was still a student of Law at the Beirut Arab University from which he graduated in 1996. Upon completing his training period, his responsibilities expanded as he was then overlooking all lawsuits and matters relating to the Firm’s main clients where he quickly evolved to handle the management of the firm in the year 2002. His passion for Commercial Law and Companies Law led him to establish the Firm's “Company Formation Department” in 2005. Loay has over 20 years of experience specializing in Litigation, Banking, Insurance, Corporate, and Maritime Law, and has been involved in all of the firm's significant lawsuits since he joined, he is also keen to keep up with the legal principles passed by the Cassation and the Constitutional Courts in addition to current development in Laws. Right around her final year at the university, she joined A.Ghani Qarooni & Associates where she was immediately seconded with the Telecommunications Regulatory Authority for its first year following its establishment. She graduated from Bahrain University in 2004 and proceeded right away with her two year training program. She is a member of the Bahraini Bar Society as well as an Associate member of the Chartered Institute of Arbitrators. Shortly after its establishment in 2005 and upon being registered with the Bahrain Investor’s Center as a professional body, she started heading the Firm’s “Company Formation Department” which has widened her experience in that field. She also deals with many Labor Law related issues on a day to day basis, and is also in charge of the overlooking the management and the flow of work at the Firm. 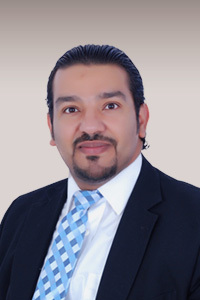 Member of the Bahraini Bar Society, a certified Arbitrator at the Arab Authority for Arbitration and Law and a registered Arbitrator at the Courts of the Kingdom of Bahrain, he graduated from Bahrain University in 2004 and immediately began training with A.Ghani Qarooni & Associates, and quickly progressed to become a Partner with the Firm at the beginning of the year 2010. S.Mahmood is handling some of the Firms main clients and has over 10 years of experience of specializing in the field of Banking Law and drafting of commercial contracts, he has widen his knowledge in the Banking field through handling countless banking & commercial lawsuits. S.Mahmood is also responsible for the Firm’s training programs and handles part of the Firm’s management and IT matters as he is a holder of MS Office Applications Diploma. Ameera began her career working as a secretary at one of the Law Firms in the Kingdom of Bahrain where she discovered her love for Law. She joined Beirut University in the year 2007 and graduated from the School of Law in 2010. She immediately joined the same Law Firm as a trainee, in 2011. In 2013 Ameera joined A.Ghani Qarooni & Associates where she shortly after that obtained her licenses as a Lawyer from the Ministry of Justice and Islamic Affairs. She prosecutes all types of lawsuits before all types and levels of the Bahraini Courts and is considered an important assist to our Firm. Huda began her professional career while still studying Law at the University of Applied Sciences, Kingdom of Bahrain. She has five years of work experience with different companies in the secretarial and HR field. Huda graduated from Law school in the year 2014 and joined A. Ghani Qarooni & Associates on Feb 2015 to pursue her career as an Attorney & Legal Advisor. She is interested in Commercial & Companies Law, and she is eager to learn the fundamentals of the legal profession and is looking forward to obtained her licenses as an Attorney from the Ministry of Justice and Islamic Affairs. Holder of Accounting Diploma, she joined as a secretary at A.Ghani Qarooni & Associates since 1995 and has been working for the Firm ever since. She currently holds the position of Office Manager and is responsible for the overall administration and coordination.